This was an extensive project on a brand new house. Huge feature paved areas and circular pathway, decking, raised beds, turfing, planting , seating, pergola, shed and base installation and electrics. The brief here was simple, create a flat area within the sloped garden to provide a small area for her child to play on his tractor. Mrs Craig was very budget conscious but we managed to pull the whole re-design in in under £4000. This included excavation, sleepers and the laying of pavers. 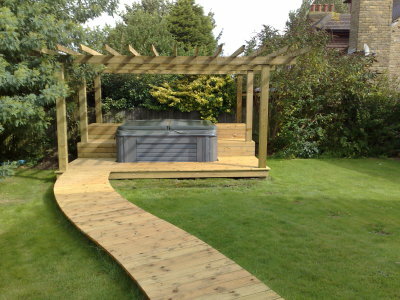 Another large project which included a timber feature and seating area around the hot tub with elevated decked walkway. 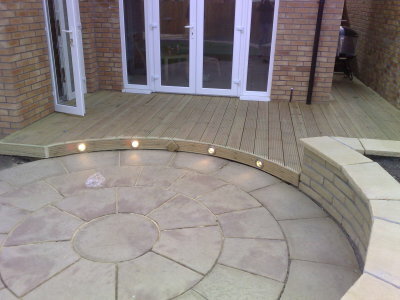 A Monoblock pavement was also installed around the extension with a walkway to a newly created Fire Pit. New deck and balustrade installed along with 35m2 of Marshall's paving and edging. 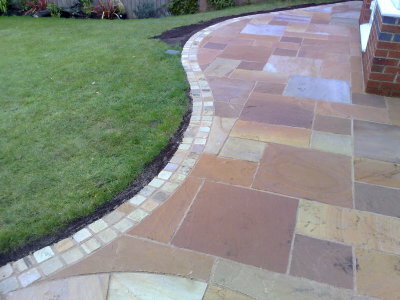 This was a challenging project as all landscaping materials had to be brought through the house. This was a classic case of mixing the old with new. 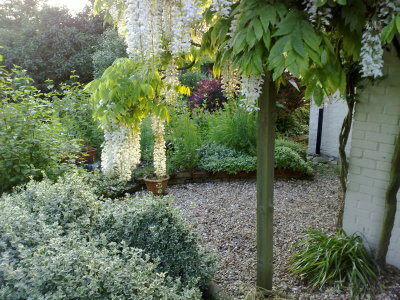 The sloped garden was very un-organised with no defined usable spaces. 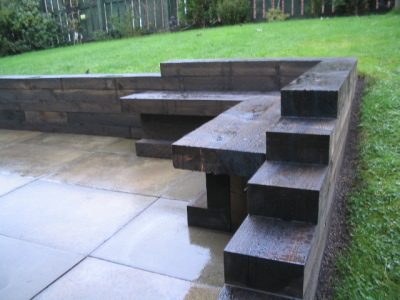 We installed a multi level deck, rendered wall and seating areas. 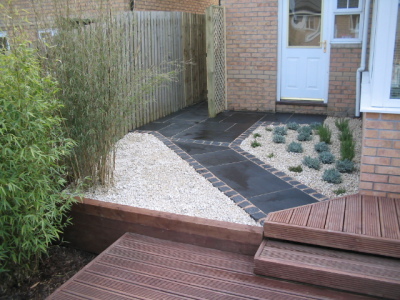 In addition to this we laid a contemporary black slate patio area and planted a range of architectural styled plants. 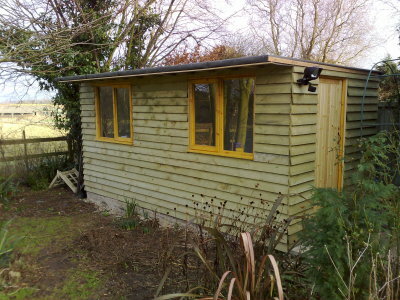 Mr Kemp asked us to install a simple office space in his garden from which he could work from. We built a 12 x 6 frame and weather boarded it and inserted a door and 2 windows. The office was laid on a concrete plinth and included internal insulation, internal walls, power and lighting. 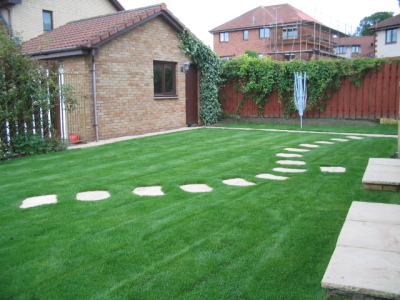 We installed a circular patio as the centre piece for this garden with an additional large patio formed from it. 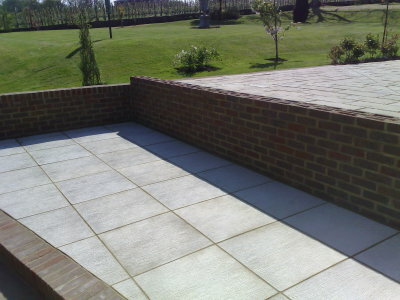 The overall patio was approximately 35m2 with matching block edging. In addition to this we built a small retaining wall to one side of the patio so as to incorporate the sloping grass verge. Probably one of our largest domestic landscaping projects to date. We installed over 120m2 of Indian Sandstone around a swimming pool. The work also included a large brick retaining wall and the installation of high quality Jackson Fencing Panels around the perimeter. A garden laid mainly to lawn with a selection of fruit trees. The garden had stunning views out however, there was nowhere to place a table and chairs. We build a large split level patio with retaining wall between and created an area for a new greenhouse. As part of a major re-vamp on her house, Miss Scott asked us to create a garden with defined areas, namely lawn and large patio. 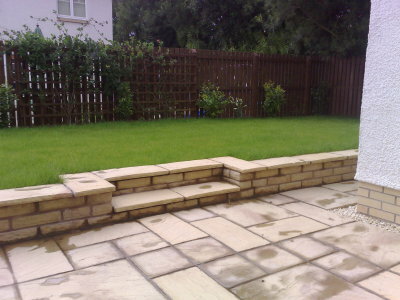 We installed quality Marshall's paving along with matching wall, steps and coping slabs. We also rejuvenated the poor soil and laid Medallion Turf. No design input from us here really, Mr and Mrs Kirk knew exactly what they wanted and how they wanted it. 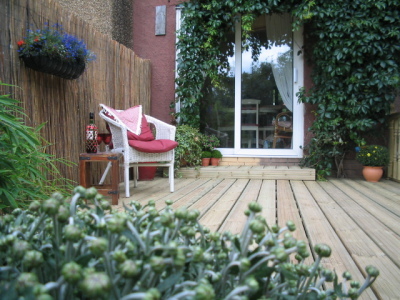 The garden was completely overgrown and unusable and we were asked to make it as maintenance free as possible. 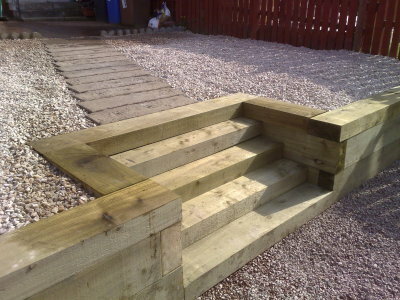 Simple Sleepers to create the wall along with large chipped areas. Again, a very poor lawn with no sense of purpose to the garden, we rejuvenated the soil by inserting drainage and topsoil and laid fresh grass. We also installed a solid pathway to the garage and gate and new stepping stones to the patio. To tie it together we replaced all steps to the house.